New York Senator Kristian Gillibrand was interviewed on “The Late Show with Stephen Colbert” on Jan. 15, 2019. There she informed the audience that she is entering the 2020 presidential race, hoping to become the Democratic nominee. Colbert told the audience that Gillibrand was a last minute booking. He asked the Senator why she was on his show, and she replied she was filing an exploratory committee to help her run for president. Gillibrand is scheduled to travel to Iowa this weekend and will begin campaigning immediately. He then questioned her about why she wants to run for the presidency to which she responded that she was a young mother and she will fight for other people’s children. Gillibrand believes it is the right for all Americans to have health care and thinks that public schools need to be improved. Gillibrand started in politics as a U.S. Representative from 2007 to 2009. In late 2009, she joined Senator Chuck Schumer and became the junior senator from New York. In the last election, she easily beat the Republican nominee Chele Farley to secure another six-year term. In the past, Gillibrand has also worked as a lawyer and on Hillary Clinton’s 2000 U.S. Senate campaign. Gillibrand has been a strong advocate for women’s rights, causes and electing more women to public office. She has also been one of Trump’s staunchest critics and has voted against almost every nominee Trump has suggested for positions within the government. 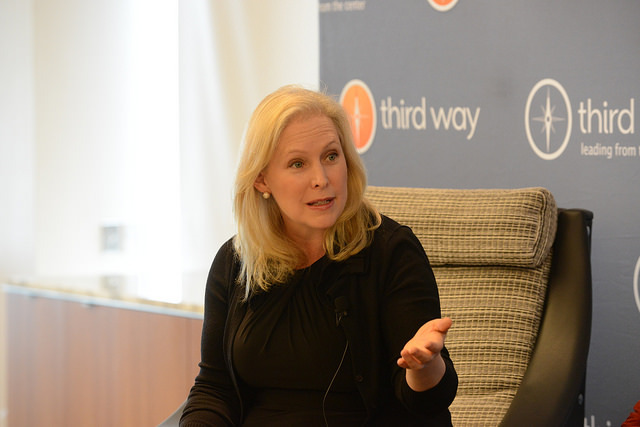 3 Responses to "Kristen Gillibrand Senator From New York Enters the Presidential Race"